College football • Defensive end is natural leader, Whittingham says. Trevor Reilly, University of Utah, Monday, April 23, 2012,in Salt Lake City Utah. Photo by Tom Smart/University of Utah Sports Information Scott Sommerdorf | The Salt Lake Tribune Utah LB Trevor Reilly greets fans at the "Ute Walk" prior to the game at Rice-Eccles stadium, Saturday, September 15, 2012. Utah defensive end Trevor Reilly spent the summer stabilizing his surgically repaired knee, increasing his strength and getting faster. 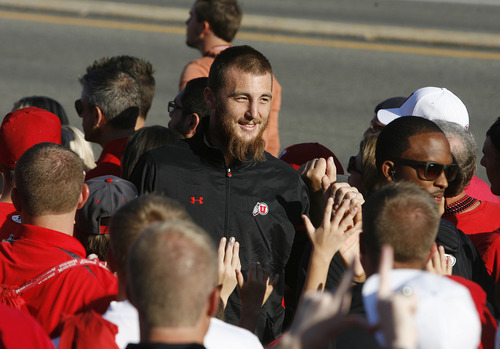 Now he wants to do the same for Utah&apos;s defensive unit when the Utes open camp Aug. 5. Reilly, who earned an All-Pac-12 honorable mention in 2012 despite playing with a torn anterior cruciate ligament in his right knee, is determined to end his college career with a good year for himself and the Utes. "We had some ups and downs that were out of our control," he said, referring to Utah&apos;s injuries at the quarterback position. "But we are ready to go now." Reilly represented Utah along with tight end Jake Murphy at the Pac-12 media day in Culver City, Calif. 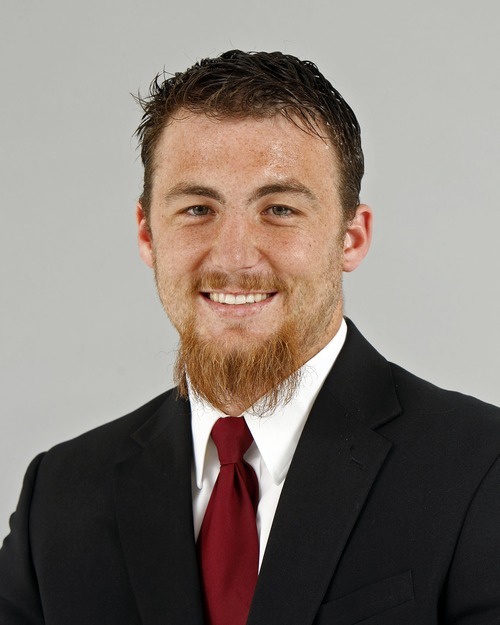 He was selected because he is a natural leader and good spokesman for the team, according to Utah coach Kyle Whittingham. Reilly is expected to fulfill the same role on the field when the season starts. He already has his coach&apos;s respect after leading the team last year with 69 tackles and three forced fumbles. "There aren&apos;t many guys who could have played on a knee like that," Whittingham said. "He is a tough guy and he should be in for a very good year for us." The Utes need a good year from Reilly to help a defense that was average but not great in 2012. Utah allowed an average of 363 yards and 25 points a game, but gave up too many big plays and didn&apos;t create enough takeaways. As Whittingham said, the Utes aren&apos;t accustomed to average. "We need to be better than that," he said. Reilly believes the Utes can improve. He, for one, feels better about his own play now that his knee is repaired. "I&apos;m a lot more stable than I was last year on it," he said. "I didn&apos;t want to sit out spring ball, but I had major knee surgery and it was the reality of the situation. I&apos;m ready for camp now." Reilly said Utah&apos;s defense doesn&apos;t need a lot of work overall, just some attitude adjustments and increased efforts overall. "It comes down to personal accountability for every position," he said. "If you win your personal battle, then the game takes care of itself." The defensive end spot is a position that should be strong for the Utes. Reilly is healthier, Nate Orchard has experience and Jason Whittingham is an up-and-coming player moved from linebacker to end. When it comes to leadership, Reilly believes he, linebacker Brian Blechen, tackle Tenny Palepoi and safety Eric Rowe will set the standard for the defensive unit. "We need to be leaders," Reilly said. "You can&apos;t always lead by example. Sometimes you need to step up and talk in terms." Watching his teammates practice in the spring when he couldn&apos;t participate was difficult, Reilly said. He occupied some of his time by honing his golf game, a sport he described as "addicting." But hitting a little white ball across a manicured field isn&apos;t the same as getting down and dirty in the trenches of the Pac-12 in the hunt for quarterbacks. His improved health, a fresh outlook and a long offseason have Reilly eagerly awaiting the start of camp. "We&apos;re ready to go," he said.